Is it even possible to measure the impact of measurement? And if we could, why would we bother? can a scale weigh itself? can a tape measure measure its own length? 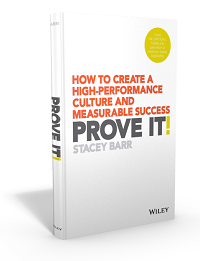 can performance measurement measure its own performance? And given that most of us struggle with measuring business performance, doesn’t it stand to reason that we’d struggle even more with measuring the impact of measuring business performance? Meaningfully measuring how well we measure, when we don’t measure well yet, seems illogical. One of my clients once asked me how I could prove that measurement is worthwhile. That’s a challenge, because to prove it, we have to measure it where it’s happening. And for most organisations, it either isn’t happening, or isn’t happening well enough to provide any good data about the ultimate benefits of it. But the way we get better at measuring performance is the same way we get better at measuring the impact of measuring performance. It means following a logical procedure. Firstly, what impact do we want measurement to have? Measuring speeds up the feedback we get about what works and what doesn’t, so we reach our goals sooner. Measuring has more objectivity than gut feel or hearsay, so we waste less effort doing things that really don’t help us reach our goals. Overall, when we measure, we get better returns on our time and resource investments to reach our goals. There are certainly other benefits of measuring, but these seem to me to be the ultimate benefits. Secondly, how could we quantify that impact? Reaching our goals sooner: if we counted the days or weeks to reach each of our goals, we’d be able to measure the goal achievement lead time. Reaching goals with less effort: if we counted the time and money spent to reach each of our goals, we’d be able to measure the goal achievement cost. Reaching goals with a higher return on time and resources: if we counted the value of the time and resources, and counted the value of the gap we closed in reaching the goal, we’d be able to measure the return on investment, or ROI. If we tracked each of these measures before and after using performance measures of our goals, we’d see an improvement when we started to use performance measures of our goals. Thirdly, what data do we need for these measures? We have to start capturing the data about when we set each goal, when we achieve each goal, and how much time and money we spend achieving each goal. It can also help to capture the bottom-line impact, if we can, of achieving each goal. That makes the ROI measure (the third one listed above) possible. So it’s certainly possible to measure the impact of performance measurement. But the question remains: why would we bother? 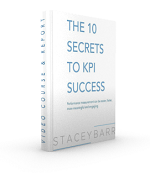 You are prepared to start measuring these BEFORE you implement proper performance measures for your goals (using a proper measurement methodology), so you can observe the impact of those proper performance measures. My guess is that doing this is not likely to happen in the majority of organisations. If you have the wherewithal to do that, you will probably just put the effort into performance measures for your goals. And trust that measuring performance well is better than not measuring it at all. The impact of good performance measures is to achieve our goals sooner and with less effort. Do you think it’s possible – or even meaningful – to measure the impact of performance measurement? A nice response to Ines query: compact and clear. I made this the topic of my PhD Dissertation. I started work on it in 2010, and submitted my Dissertation Report in 2014. in 2015, I was awarded the PhD by Delhi University. And before 2010, I was in the Corporate World from 1977 to 2007. Worked with Unilever (visited Australia in 1984) and ArcelorMittal. Took premature retirement, after 3 years as a CEO, to work for my PhD. So, my views are from a mix of Corporate responsibilities focused on delivering performance to academic study of the ‘why’, ‘how’ and ‘how to’ of delivering a performance measurement system that adds value. Having done all that, I took a sabbatical for two years, and enjoyed travelling with my wife. And now, am again inclined to do something with all the knowledge and wisdom that I have acquired. So, lets be in touch! I think the old adage “what gets measured gets managed” speaks for itself. Thanks Stacey, this is certainly a compelling topic. One of the challenges of the “time to goal attainment” topic, is of course that not all goals are the same (either is scope or viability to achieve, or in their ultimate impact on long term organizational vitality), and so measuring duration to goal attainment isn’t truly helpful. Any organization that put such a measure into place would likely stimulate a “make the goals quicker/easier” response, so they could show progress/success. It’s a thorny problem. I look forward to more dialog on this issue. As you indicated, being clear on “why” and are we achieving our why (or making demonstrable progress) is probably more important to figure out, than a specific measure such as goal “speed”. Point taken, Matt. I’m not convinced we should ignore feedback about how well we achieve goals sooner. Taken in isolation, like any measure of performance, will likely drive the wrong behaviour. But collectively, that we achieve the goals that matter, sooner and with less effort, is why we measure. But the comparison I’m more interested in is the general direction of the speed, over time. Not a comparison between goals. I can’t think of a single reason for NOT measuring the impact. How else can we justify the time and other resources that are clearly used to design and use measures? There is an underbelly of cynicism as far as performance measurement is concerned, with many people remaining unconvinced that it is worth the time and effort. The more we can do to counter that feeling, the better things will be in all fields in which PM is used. Yes, agree with you Robert. I am convinced, from how much I’ve seen of attitudes towards performance measurement over my 2-decade career, that we have to stop doing the bad things with measurement that have caused the cynicism. Stop judging, stop measuring people, stop measuring what’s easy. Start learning, start measuring processes we want to improve, start measuring what we need (and finding the data for that).